City of Orlando — Learn Jelly, Inc. Learn Jelly offers onsite programs that are standards and project-based for organizations that serve elementary students. The goals of the program are the following. Improve Learning Skills - Stories allow students to feel and see the information, as well as factually understand it. As a result, the information is more likely to be imprinted on the brain in such a way that it sticks with the individual longer, with very little effort exerted on their part (Neuhauser, 1993, p.4). Improve Reading Comprehension - Visualizing refers to our ability to create pictures in our heads based on text we read or words we hear. It is one of many skills that makes reading comprehension possible. This method is an ideal strategy to teach to young students who are beginning or struggling readers. Increase Computer Science (CS) Exposure - The most important part of the computer science experience is its ability to encourage and support creative expression and problem solving. As Seymour Papert said more than 30 years ago, CS is about giving kids the opportunity to engage with powerful ideas. Improve Critical Thinking Skills - Teaching coding helps young students learn important creativity, conceptualization, application, analysis, and evaluation skills which will position them well for success as they move through school and life. During the program, we accomplish these goals by guiding students through the Learn Jelly project-based learning experience, which requires them to read or write stories based on an academic concepts and then transform them into animations through drawing and coding. Content Comprehension, Reading, Art, Critical Thinking, Coding Practice and Programming. Visualization, Retelling, Creativity, Independent and Collaborative Working, Problem-Solving, Critical Thinking, Presentation and Communication, Persistence, Comprehension, Integration of Knowledge and Ideas, Computing Practice and Programming. During the 1-month program, 3rd, 4th, and 5th grade students read stories based on academic concepts and then transform them into animations through drawing and coding activities. Align program projects with concepts that are being taught by academic instructors located at the centers. Improve reading and learning comprehension by teaching students visualization and retelling skills. Improve student's thinking skills through computational thinking activities (coding). Introduce student to basic coding concepts through animation activites and programming tools. Classroom Alignment - Retelling a story to include the characters, setting, and problem with solution. 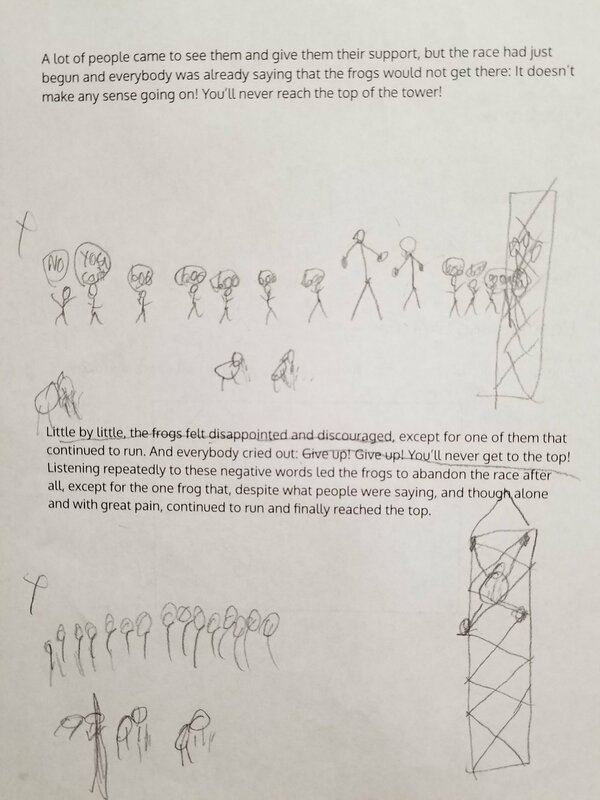 Students read a story about a frog race and where required to visualize the 4 parts through an initial sketch. 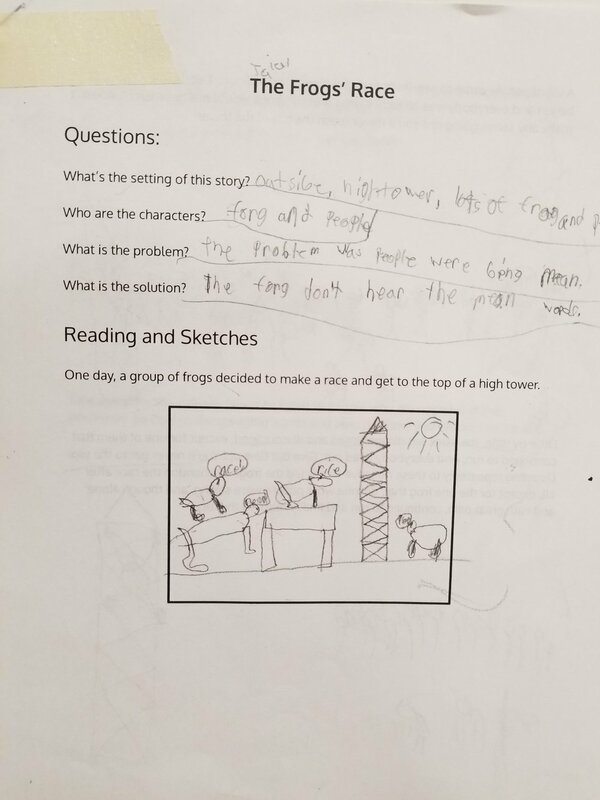 Additionally, students had to identify the setting, characters, problem, solution and moral of the story. Students use their sketches to create a final drawing of the story. The goal was for students to visualize all of the major story elements and to use their final drawing as a guide during the story animation phase. Students use the Scratch Jr. program to animate their final drawings. Classroom Alignment - Identify and describe various rock formations. Students read and sketched the descriptions of three rock formation types (sedimentary, metamorphic, and igneous). Students use their sketches to create a final drawing and diagram of the rock formation descriptions. The goal is for students to visualize all of the major themes of the rock formations. Students read and sketched a timeline that provided a snapshot of events and sentiments surrounding the formation of the Declaration of Independence. Students use their sketches to create a final drawing of the timeline. The goal was for students to visualize the various stages identified in the timeline and to use their final drawing as a guide during the story animation phase. Writer - Responsible for creating a short story and movie script. Artist - Responsible for creating a storyboard of the short story and script. Programmer - Responsible for animating the storyboard using the Alice coding program. Director - Responsible for leading the group and ensuring all elements of the project are complete and high quality. Story structuring utilizing the Pixar model and a writing map. Basic programming concepts and the Alice 3D coding program. Note: Students created animation using the Alice program. Learn more about it by clicking here.